The Lagotto Romagnolo is a dog that has been specially bred to find truffles on all kinds of terrain; it is the only breed in the world specialized in tracking down this precious tuber. A typical water dog of small-medium size, it is a light mesomorph with a rather stocky trunk. Its general appearance is rustic, strong and well-proportioned and its utility as a working dog is immediately obvious. The expression is one of attentiveness, intelligence and vivacity. The Lagotto Romagnolo works enthusiastically and efficiently, making the most of its inherent search-and-find skills and excellent sense of smell. The hunting instinct has been suppressed so that it is not distracted by game. An affectionate animal, it forms a close bond with its owner and also makes a fine, easy-to-train companion. The Lagotto Romagnolo has the restrained character of the true country dog, the typical appearance of a dog which has its roots in history and the gentle, attentive expression common to all dogs of Italian breed. A first glance gives an impression of something historic and archaic that has miraculously survived to the present day – a living challenge to time and history. Many centuries ago the people of Italy developed a thriving trade with the Orient. 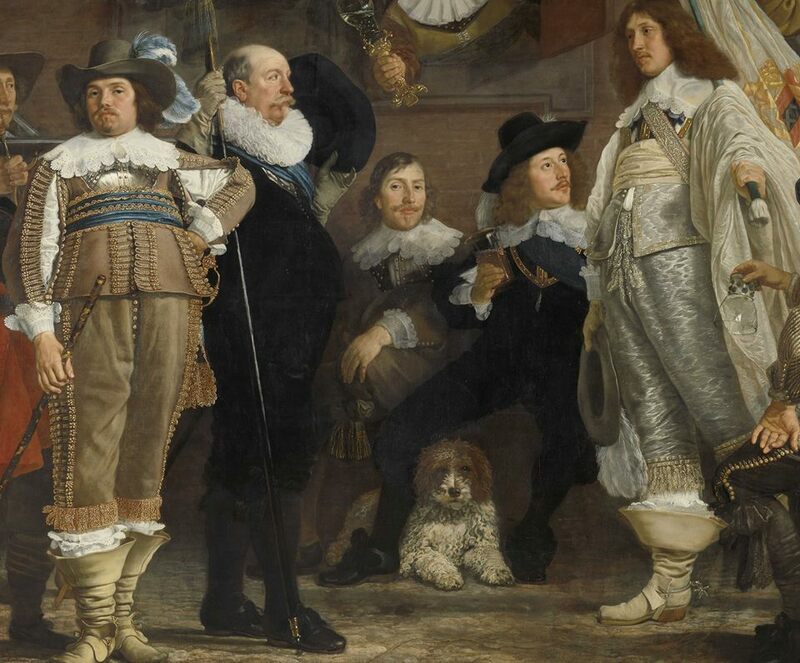 This system of commerce involved continuous contact at every level, thus allowing the different populations to learn much about each others’ cultures and customs - and a knowledge of dogs was no exception to that rule. This explains why so many archaeological sites, especially in north-west Italy, have revealed the presence of various canine breeds, especially a small water dog with a bristly, crimped coat. The Etruscan necropolis of Spina (near Ferrara) contains updated representations of hunting and fishing which consistently include a dog like the current Lagotto Romagnolo. The Etruscans reached the northern Adriatic between the sixth and fifth centuries BC and maintained commercial relationships with many Eastern nations; this favored the introduction of this group of dogs into the northern Adriatic region. While it is true that the expansionism of many eastern populations was responsible for introducing these breeds as far afield as the British Isles, it should be noted that this happened centuries after the initial contact with Italian populations.When water dogs reached Spain via North Africa at the time of the Moorish conquests, giving rise to the present-day Perro de Agua Español, they had already been on the Italian peninsula for centuries, especially in the wetlands and marshes of Romagna.It is thus quite probable that the Canis acquaticus of which Linneo spoke, defining it as having “been around for some time” in the Mediterranean Basin, is none other than our Lagotto Romagnolo. In its morphology, the drawing made by Linneo bears a striking resemblance to the curl-coated dog of Romagna. 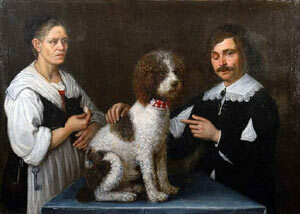 Another painting from the 1600s shows an almost perfectly conformed Lagotto Romagnolo as the subject of a painting by il Guercino" Giovanni Francesco Barbieri. Following the disappearance of the Etruscan civilization water dogs continued to flourish, remaining a common sight throughout Roman and medieval times, especially along the tract of coast that runs from Ravenna, through the Comacchio and Veneto lowlands to Friuli and the Istrian peninsula. 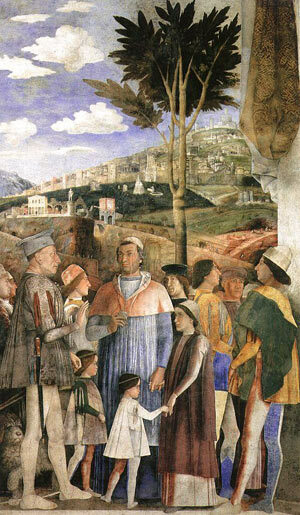 In the frescoes of the Bridal Suite of Palazzo Ducale dei Gonzaga di Mantova, created by Andrea Mantegna in 1456 there is, in the scene representing the “meeting”, at the feet of the marquis Ludovico III Gonzaga, a dog which is apparently the same as today’s Lagotto Romagnolo (above). From the 16th century onwards books on folklore, local culture, customs and hunting are full of citations that mention the utilization of a small curly-coated dog used to retrieve water game. These dogs carried out a number of activities, providing support for the vallaroli (or “lagotti”), picturesque folk who, prior to the sweeping land reclamation of the late 19th century, were the real soul of those game-rich lagoons. The vallaroli, who were granted use of the famous “tinelle” or “botti” (marshland hides made from barrels) for lowland hunting, generally accompanied the local gentry in the fascinating, yet difficult practice of hunting. The vallaroli were also trained to find truffles: back then far less was known about truffles and they were far more abundant. The inseparable companions of the vallaroli were the small Lagotto Romagnolos, guardians of boat and house, and excellent retrievers (especially of coots) way back when hundreds of small boats would “beat” the hunting ground and surround and kill flocks numbering thousands. The Lagotto Romagnolo would, often for hours on end, dive into the water whatever the season, even breaking through ice to swim under it and drag the fallen birds back onto the shore (an activity made possible by the animal’s compactly crimped coat and thick undercoat which forms a water-repellent layer that keeps the water off the skin. The name Lagotto Romagnolo derives, then, from its original “career” as a water dog. In the local dialect of the Romagna “Càn Lagòt” is synonymous with “water dog” or “wetland hunting dog with crimped, curly coat”. A sharp aptitude for searching, a steep learning curve and an unbeatable sense of smell, would, in time, make the Lagotto Romagnolo an efficient truffle-finder. Following the cleansings which, during several decades, constantly reduced the immense marsh of Comacchio and of Romagna, while making disappear almost completely the “Vallaroli”, Lagotto Romagnolo also gradually lost its function of water dog andspecialized gradually as a truffle dog. The transition between these two functions ranges between 1840 and 1890. One can even affirm that during the time between the two world wars, almost all of the truffle dogs of the truffle hunters of Romagna and the adjacent areas were Lagotto Romagnolo. In subsequent decades the use of concrete pylons to support grapevines and the steady disappearance of woodland has made the truffle a somewhat rarer find, especially on the plain. The Lagotto Romagnolo then turned out to be the perfect choice for searching in hilly woodland and thorny scrub during the autumn-winter period on account of its tightly-knit coat. Even as far back as 1920, the Lagotto Romagnolo was well known in the valleys of the Romagnolo Apennines, in the Valle del Senio, Valle del Lamone and especially in the Valle di Santerno. It should be born in mind that back then no-one was interested in the Lagotto Romagnolo as a pure breed: the existing breeds were considered to be more than sufficient and the cross-breeds were often even more appreciated on account of their robustness, character and resistance to disease. Truffle hunters have always bred their dogs on an entirely empirical basis (outside of any genetic rules), taking into account only the immediate, practical outcome: a brilliant truffling dog, whether Lagotto Romagnolo or not. In this manner, Lagotto Romagnolo, which had arrived in the valleys of Romagna “fixed” by the continuous couplings in narrow consanguinity carried out by the “Vallaroli” of the marshes of Comacchio started “to be polluted” by constant and unjustified introductions of foreign blood. However, merit where merit is due: the truffle hunters of that period did not let our Lagotto Romagnolo fall by the wayside, allowing it to survive - almost by miracle – to the present day in near-perfect phenotype and genotype form. Towards the mid 1970s a group of Romagna-based dog lovers decided to save the breed, which was risking extinction as a result of the incompetence, ignorance and negligence of owners: The group was led by the gentlemanly Quintino Toschi, President of the local dog society and the E.N.C.I. breeder and judge Prof. Francesco Ballotta (who still remembered the Lagotti Romagnolo of his youth perfectly). They were supported by dog expert, judge and world-famous breeder Dr. Antonio Morsiani and Lodovico Babini, a Romagna-born dog lover with extensive experience. They were to set a genetic reconstruction program in motion that would save the Lagotto Romagnolo from the one-way tunnel to extinction. The reunification of the two parallel stories of the Lagotto Romagnolo – the one that took place in the wetlands and the one that took place on the Apennine hills – were to lay the basis for the renewed purity of the breed. With the founding of the Club Italiano Lagotto (C.I.L.) in Imola in 1988, which now has 300 members all over the world, a firm foundation for official acknowledgement of the breed on the part of E.N.C.I. and F.C.I. was created. Official recognition by E.N.C.I., with approval of the morphological Standard drawn up by Dr. Antonio Morsiani (following years of biometric measurements on hundreds of subjects), was achieved in 1992. In 1995, thanks to the constant dedication of the Club and its technical bodies, provisional international recognition by F.C.I. was won. In the meantime the breed has enjoyed European and even worldwide success and the number of pups registered at the various F.C.I., British and American Kennel Clubs is constantly growing. For example, in Italy, 545 pups were registered in 1994 and nearly 900 in 2002 - a near-doubling of births in just 9 years. In countries such as Switzerland, Finland, Sweden, Great Britain the number of registered pups has increased tenfold – and in some cases a hundredfold. The rapid international diffusion of the breed is highlighted by the constantly increasing number of pup registrations in countries such as Switzerland, Holland, Germany, France, Finland, Great Britain, Australia, and The United States. In order to safeguard and coordinate proper morpho-functional selection at international level 1997 saw the establishment of U.M.LAG (World Union of Lagotto Clubs - Unione Mondiale dei Club Lagotto Romagnolo), the president of which is Dr. Giovanni Morsiani. Lagotto Clubs in all the above-mentioned countries are members of this association and there is a constant stream of affiliation applications from new clubs all over the world. To safeguard the breed against hereditary pathologies, the Italian Lagotto Club has, since 1992, been involved in the official control of hip dysplasia in collaboration with the Centro di Lettura (Analysis Centre) directed by Dr. Cesare Pareschi of Ferrara. The C.I.L. recently acknowledged E.N.C.I. directives vis-à-vis hereditary genetic disease control, providing the Centro di Lettura with the support of the F.S.A. (Animal Health Foundation) of Cremona, directed by Dr. Aldo Vezzoni. The Club’s Technical and Health Commission has, for years now, been carrying out careful in-the-field checks and controls as regards the most common hereditary diseases affecting water dogs with continuously-growing curly coats. Other checks are regarding the main hereditary eye diseases and some heart conditions. In order to maintain the original working capacity of the Lagotto Romagnolo, the “Quintino Toschi” Italian Lagotto Club has, for some years now, organized truffle-finding (working) aptitude tests and trials throughout Italy and has obtained excellent results in terms of both quantity and the perfecting of the breed’s functional qualities. This allowed us to draw up a Working Standards Proposal for the breed (together with Working Trial Regulations) that the Club sent to E.N.C.I. in 1999. Over recent years we have also trained Club judges to carry out the above Working Trials. At the annual C.I.L. Working Championships, disputed since 1999 in those Italian regions with good truffle terrain, a good number of dogs – from both Italy and abroad - participate in the skills section and are also entered in the “aesthetic” exhibitions. We believe this to be a clear sign of appreciation of our desire to maintain the original working characteristics of the breed. The skills tests allow the Clubs to monitor not only the morpho-functional characteristics of the breed, but also character, which has always been one of the Lagotto Romagnolo’s strong points. From a morphological viewpoint the Lagotto Romagnolo has, over recent years, been consolidated even further. Our frequent, in-depth biometric checks made at conventions, rallies and Club meetings have highlighted that the breed’s morpho-functional characteristics are perfectly in line with the official morphological standard drawn up in 1991 by Dr. Antonio Morsiani. For some time now, the Lagotto Romagnolo has shown good overall homogeneity, with constant transmission of characteristics down through the bloodline. A few years ago we contacted E.N.C.I.,suggesting that the morphological standard be clarified by two additional observations vis-à-vis grooming and color of the coat. This has become necessary to prevent dangerous deviations from the breed’s true rustic nature which can be induced by exaggerated, non-functional grooming by professional handlers both Italian and foreign. Otherwise, the original Italian Standard is - and remains - the ideal portrait of our breed.